The recent Halloween/Snowtober event we endured involved a lot of powering down in the Northeast. We were prepared for the worst, with batteries for flashlights and canned goods at the ready. Me and my neighborhood fared well, suffering no power or heat loss; But I was left with a few too many cans of soup. It should be noted; I am, among other things, a self-professed soup connoisseur. I love to plan ahead with a new recipe or pick through the fresh ingredients from my fridge to see what I can create without a trip to a market. Anyway, I was feeling less than energetic last night, so I thought, why not? I carefully chose a yummy sounding chicken noodle with a picture of a real chicken and a porcelain bowl of the steaming soup on the label…It was so bad that I offered it to my dog who also decided against it. Soups and stews are like books. You need good bones, good ingredients, before you can taste the reward. I had the opportunity to read some of the worst childrens books ever over Snowtober week. (One even had a picture of a real chicken on the cover) My little friend Phil stayed with us while his home lay cold and dark, so we took full advantage of story time. Phil’s library strategy involves pulling off as many books at eye level and dropping them into the bag Sally is holding. Discriminating good from bad hasn’t factored into his repertoire yet. I had been trying for several visits to get Phil to read one of the three Shel Silverstien poetry books we have. He would take a look at the black and white covers, sans swords and guns, and adamantly say, no way. 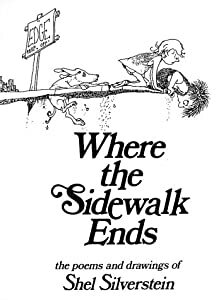 After another trudge through a particularly annoying fairytale-gone-bad story, I simply started reading aloud from my beloved, Where the Sidewalk Ends. It wasn’t long before Phil was hooked and laughing out loud, and then we proceeded to read through two of the three large volumes of Shel Silverstein poems from my bookshelf. Upon the last night of of his stay, I offered one of the library books to Phil to see how he would react. He simply picked another one of Shel’s books and left the annoying fairytale-gone-bad story for the dog, who promptly ignored it. If I can make a stew out of me. In the bubbling water-I won’t scream a bit. I’ll taste myself often to see how I’m doing. And serve myself up at a quarter to noon. Farewell-and I hope you enjoy me with crackers! This entry was posted in general and tagged blogging on writing, canned goods, chicken noodle soup, Children's literature, creative writing, Giving Tree, Home, Poetry, Shel Silverstein, Sidewalk Ends, soup, Where the Sidewalk Ends. Bookmark the permalink. What a phenomenal post Sally! As a fellow lover of soup, I completely agree on both soup and books! I get that same feeling of “meh” with flavorless soup as I do a book with a blah plot and even more blah ending. I think both soup and good stories need fresh ingredients and lots of low simmering to really be fantastic! Yes! simmering, I intended to use the simmering metaphor but got lost in development! Thanks Stacey. Odd you should write about childrens’ books. I was thinking recently about a collection of “Little Golden Books” I had when I was a child. The illustrations were very well done, and the stories were delightful. I wonder if they are still being printed. When my kids were little in the 90’s, I joined a sort of chain letter for Little Golden Books. It wasn’t three weeks before I had more than I knew what to do with! The Pokey Little Puppy was my favorite. But not quite the level of a Shel Silverstein book! Thanks for checking in , Trudy. Great blog, Sally. Anyone ever read Uncle Wiggley? Can’t remember the author but sure remember the fun characters. One was Nurse Jane Fuzzy Wuzzy. And of course the one and only Uncle Wiggley. I gave this book to one of my girls for the children. It still has stickey jelly marks all over numerous pages. Love this post Sally…it put a big smile on my face!